The awards celebrate the very best in enterprise learning and skill development across the UK. LSBU offers a wide range of enterprise support throughout the year to students and graduates via in-curriculum and extracurricular activities. Events, workshops and competitions are delivered by the Entrepreneurship and Innovation Institute in partnership with LSBU’s seven Schools. Martina Eco is one of over 5,000 students and graduates who participated in student enterprise activities last year. Already shortlisted in the Institute of Directors Student of the Year Awards 2016, she works as a Student Adviser in LSBU’s Business Solutions Centre, whilst also growing her own business 3P Translation. 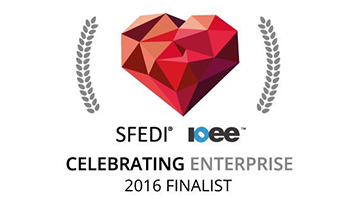 The award winners will be announced at the Celebrate Enterprise event on 10 November 2016 at the House of Lords. A full list of finalists is available on the awards website.